This study investigated the effects of combined exposure to low-dose cadmium and high-fat diet on femoral bone quality in male mice. 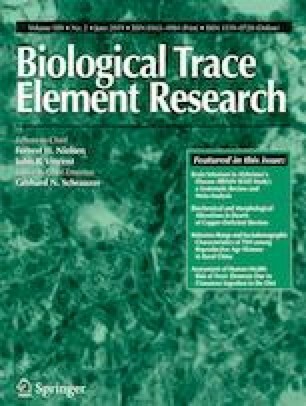 Eight-week-old male SPF C57BL/6J mice were randomly divided into four groups: normal control group (Con), low-cadmium group (Cd), high-fat diet group (HFD), and high-fat diet plus low-dose cadmium group (HFD + Cd); the second and fourth groups were treated intraperitoneally with CdCl2 (1.0 mg/kg body weight) twice weekly for 20 weeks. Assays related to bone quality were performed. Body weight of HFD plus Cd mice was significantly lower than HFD mice. Femoral length was not different among groups, but femoral weight was decreased in the HFD plus Cd group compared with other three groups. Level of Cd in bone was significantly increased in HFD plus Cd group. There was no difference in cortical BMD among groups; however, cortical bone quality parameters were decreased in HFD plus Cd group. Cd and HFD each reduced trabecular bone quality and together had further detrimental effects on these bone parameters. Based on biomechanical analysis, femoral bone strength was decreased, being more brittle and less resistant to biomechanical forces in the HFD plus Cd mice. HFD plus Cd mice had lower OPG mRNA expression and higher RANKL mRNA expression than others. HFD or Cd can cause adverse effects on bone and together had further detrimental effects associated with RANKL/OPG signaling. This work was supported by National Natural Science Foundation of China (grant number 81773414) and National Natural Science Foundation of China (grant number 81673151). Animal care followed the Guide for the Care and Use of Laboratory Animals, and the study protocols were approved by the Soochow University Institutional Animal Care and Use Committee (Permit number: 201801A346).